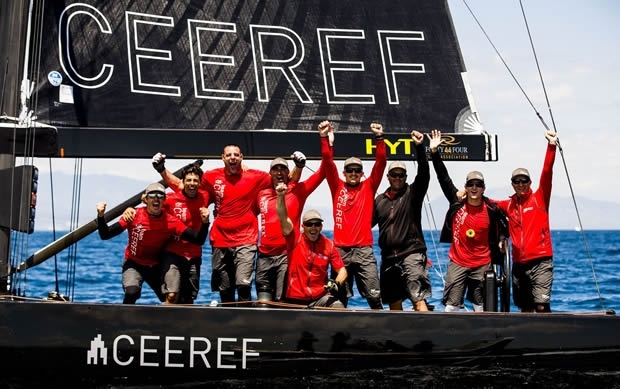 The RC44 World Championship Marina de Sotogrande had a worthy winner today in Igor Lah and his Team CEEREF crew, the second occasion the Slovenian team has claimed this prize (after Puerto Calero, Lanzarote in 2013). But this was only after some anxious moments off the Andalusian port, as Lah's crew slogged it out with local heroes, John Bassadone's Peninsula Petroleum from nearby Gibraltar. Day four of fleet racing began with Team CEEREF holding a six point advantage over her rival. In today's first race, Peninsula Petroleum won while Team CEEREF came home a disappointing sixth in the 11 boat fleet. This levelled the scoreline between the two boats. In race two, both Team CEEREF and Peninsula Petroleum were deep in the fleet but fought back to finish second and fourth respectively. This left John Bassadone's team having to finish at least two boats ahead of Team CEEREF in the last race. In this scenario some match racing was inevitable and the two boats engaged in the pre-start with Peninsula Petroleum gaining a small advantage. Sadly for them the race committee called a general recall. On attempt number two Peninsula Petroleum started in traffic near the committee boat while Team CEEREF was in clear air mid-line. By the top mark Lah's team was holding fourth while Bassadone's was in sixth. However both boats were on the ascent and on the next beat moved into second and third respectively. With some careful covering from Team CEEREF, these positions they maintained until the finish, handing the Slovenian team victory by three points. "It feels great, like the last time," enthused Lah. "This was tougher, because each year it gets harder, with each team improving a lot. We had a pretty tense race with Peninsula Petroleum, when we were match racing. We've needed a bit of time to come together as a team and to really get used to how we work with each other. Team work was the most important thing and the preparation of the boat was perfect." Not unusual in the high calibre RC44 fleet, Team CEEREF has an outstanding crew. Among others, this included British navigator Adrian Stead, Dutch Volvo Ocean Race and America's Cup winning main sheet trimmer Dirk de Ridder plus headsail trimmer, Kiwi Jon Gunderson and Italian bowman Matteo Auguardo, plus three other Italians in the middle of the boat, including their 113kg man-mountain grinder, Simone Mina. "We knew it was going to be a tough day," recounted Stead. "We said that we'd win the Worlds today by sailing well, not by looking in front or over our shoulder. It was about fighting back although it was more of a one way track today, so getting back was tough. "In the final race we were happy to get a lane out and get a good launch - we were a boat length ahead right out of the start." Disappointed not to win on his home waters, John Bassadone congratulated Lah and Team CEEREF: "We tried to approach today as if it was any other. Our objective was to sail like we know we can sail and to see where we would end up. "In the last race we had to put a couple of boats in between us, which was always going to be hard. But being five points behind then coming out to win the first race was brilliant. I'm very, very proud of the team - they sailed really well, but CEEREF have been even better. They fully deserved to win the championship." Today's other race winners were Artemis Racing and Hugues Lepic's Aleph Racing. Artemis Racing hit their stride on Saturday with the arrival of team principal Torbjörn Törnqvist, winning races on both the last two days, while Aleph Racing has also been on the ascent with new tactician Hamish Pepper bedding in, claiming today's final race. Of their win today, Törnqvist said: "We got an okay start - we wanted to go to the right, which was really strong, we found a lane and from then on it was quite easy. We managed the shifts and when you're on top its easy. It was the perfect race of the day for us. "It was a wonderful day and great sailing - it doesn't get better than that. Our team work and communication was all free flowing so we were feeling good." Among the 11 teams, competing at this RC44 World Championship Marina de Sotogrande six won races. These included defending World Champion, Team Nika of Vladimir Prosikhin and Bronenosec Sailing Team of Vladimir Liubomirov, the two stand-out campaigns of 2015, Team Nika also being the defending World Champion. From Spain, the 2016 RC44 Championship moves on to the RC44 Portsmouth Cup over 13-17th July.